A ‘GROUNDBREAKING’ new proteomics technique now available quantifies nearly all peptides and proteins in a single analysis, says AB Sciex. The mass spectrometry-based method was published recently in the journal Molecular and Cellular Proteomics. Liquid chromatography with tandem mass spec (LC/MS/MS) is a widely-used technique, but says the company is inadequate to produce complete proteome maps of biological systems. The new approach is based on ‘Swath’ acquisition to generate fragment ion maps that can be interrogated for the quantity and presence of any protein of interest. This data-independent MS/MS acquisition method generates complete fragment ion maps of high specificity. 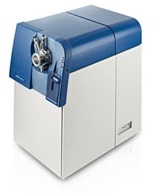 The technique relies on the AB Sciex TripleTof 5600, an advanced hybrid quadrupole-time of flight mass spectrometer. Its high resolution and mass accuracy, combined with ultra-high spectral acquisition rates, mean it is the only such instrument on which the technique can be performed efficiently, says the company. The Swath technique has been developed by scientists at the Swiss Federal Institute of Technology (ETH Zurich), led by Dr Ruedi Aebersold, working with AB Sciex. The technique generates highly specific fragment ion data for all precursors within the monitored range. It does not rely on the detection of precursor ion mass to trigger the MS/MS acquisition, but rather systematically fragments sample components through a moving selection window. Multiple ion chromatograms can be extracted from the dataset generated, and used to identify the peptide of interest. By comparison with existing public-domain ion libraries, such as MRMAtlas, or from database software such as ProteinPilot, researchers can create a complete qualitative and quantitative archive of the sample. Swath, in case you were wondering, stands for “Sequential Window Acquisition of all Theoretical fragment-ion spectra“.